We've heard of Super Paper Mario, but this is ridiculous! There's a skill that goes into the construction of papercraft models that eludes me. It just doesn't make sense - how can little sheets of paper suddenly turn into the Gundam Freedom, the Lich King's cursed sword Frostmourne, or the Hero of Time himself? I have no idea, but that doesn't stop it from being utterly incredible. The image you see here is the work of deviantART artist TouchFuzzyGetDizzy (props on the Yoshi's Island reference, man), who clearly worked hard creating these paper versions of gaming's most famous dynamic duo. 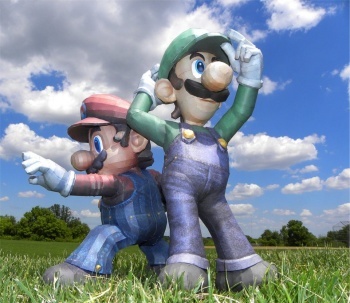 Mario stands 40cm tall and Luigi is 50cm - which our resident Brit helpfully tells us is about equal to a bit over a foot and a foot and a half, respectively - so while these papercraft sculptures aren't exactly life-size, it doesn't make them any less impressive. The artist has the patterns for the brothers linked on their deviantART page, though no instructions. Still, if you're a papercraft wizard, you probably don't need no stinkin' instructions, right? Right. Man, I wish that the artist would do more of the Nintendo cast like this. Think about it: You could set up the most awe-inspiring real-life Super Smash Bros. diorama of all time!